Ref: William Eastwood, Manukau Heads, 1874. Auckland Art Gallery Toi o Tāmaki, gift of Mr J Eastwood, 1900 1900/1/24. Permission of Auckland Art Gallery Toi o Tāmaki must be obtained before any re-use of this image. This selection of William Eastwood’s images starts on the Āwhitu Peninsula where he would have stood or sat while he sketched and painted this fine view across the harbour entrance. 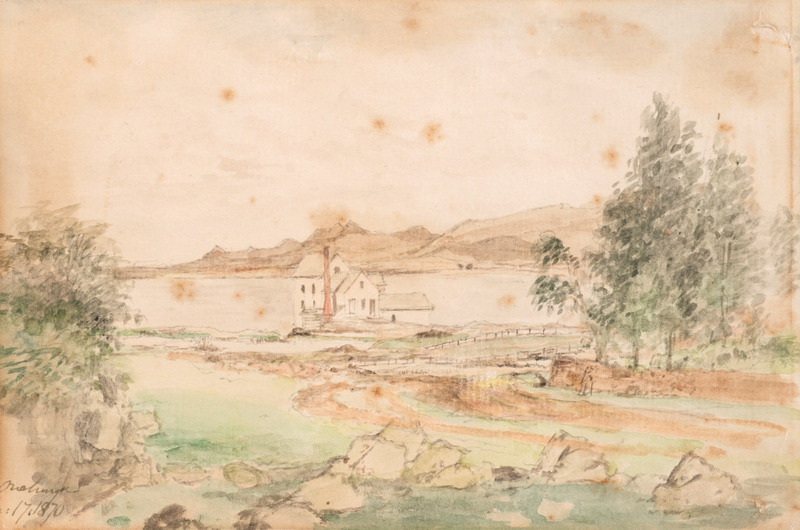 Ref: Showing a watercolour sketch of Manukau Harbour with Puketutu Island at far left, 3 January 1866. William Eastwood, Album of drawings and paintings 1863-1877. Sir George Grey Special Collections, Auckland Libraries. NZ Print 698. 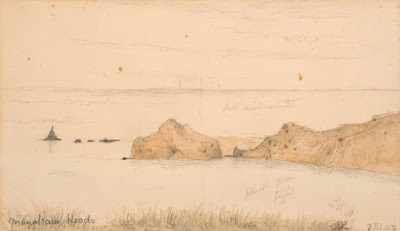 This scene appears to have been painted from a viewpoint near the mouth of Oruarangi Creek, Māngere. Part of Puketutu Island can be seen to the left, and a stretch of the Māngere coastline towards the centre right (now part of Ambury Regional Park). Ref: William Eastwood, The Manukau, Onehunga, March 1870. Auckland Art Gallery Toi o Tāmaki, gift of Mr J Eastwood, 1900 1900/1/23. Permission of Auckland Art Gallery Toi o Tāmaki must be obtained before any re-use of this image. This more intimate scene show logs lay scattered about on the foreshore at Onehunga, with the wharf to the right. The backdrop, an expansive view across the harbour towards the Manukau Heads, is lit with a rosy hue. Ref: William Eastwood, Onehunga, 12 March 1876. Auckland Art Gallery Toi o Tāmaki, gift of Mr J Eastwood, 1900 1900/1/27. Permission of Auckland Art Gallery Toi o Tāmaki must be obtained before any re-use of this image. Imposing storm clouds did not deter William Eastwood from his task when setting up his easel and paints on 12 March 1876. 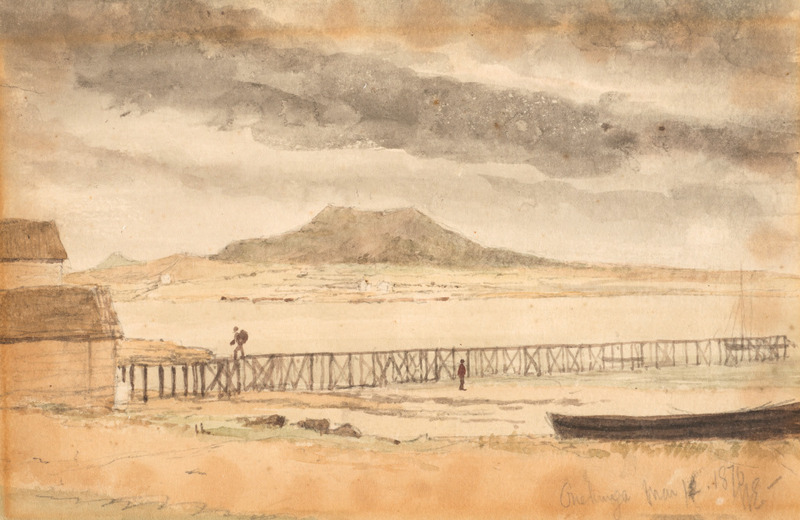 This view, from the other side of the wharf to the previous painting, affords the viewer the unusual sight of Māngere Mountain painted in shadow. Ref: Onehunga, 1870. William Eastwood, Auckland Art Gallery Toi o Tāmaki, gift of Mr J Eastwood, 1900 1900/1/31. Permission of Auckland Art Gallery Toi o Tāmaki must be obtained before any re-use of this image. Our journey ends at Onehunga, looking north-west towards the Waitākere Ranges and the harbour’s northern shoreline. Once again the watercolour painting captures the light and atmosphere of these landscapes beautifully. The exhibition Gatherings on the Manukau is on display at the Nathan Homestead during the Auckland Heritage Festival. Come along and see many more images and archives relating to the harbour. 30 September - 14 October 2017: Nathan Homestead, Manurewa. 17 October - 4 November 2017: Waiuku Library, Waiuku.